This spring, the Rogue Native Plant Partnership is partnering with the Illinois Valley Soil and Water Conservation District, and the Vesper Meadow Restoration & Education Program to host a native plant sale to the public. Plants may be ordered in advance via RNPP’s website from February 28th through March 30th. Same-day sales will be available at the Ashland pickup location only. 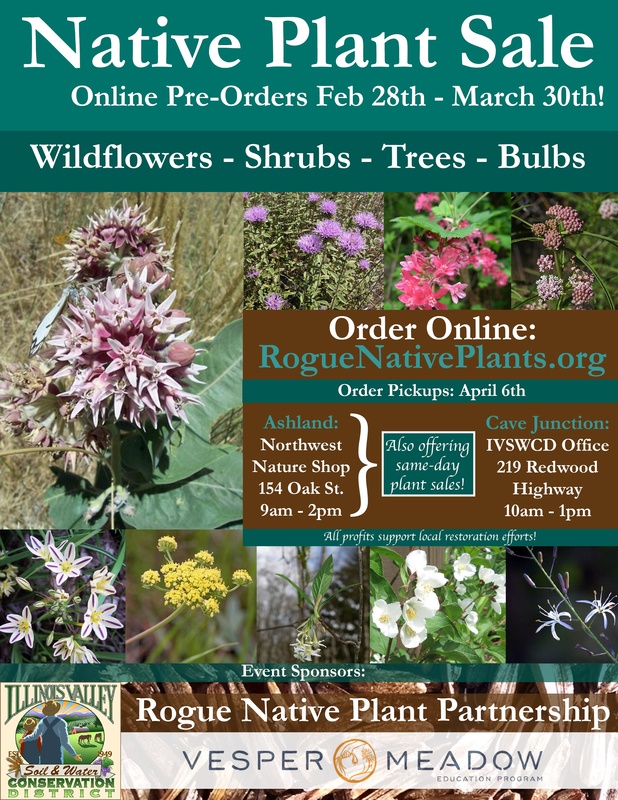 If your billing address is within Jackson County, your pre-ordered plants will be available at The Northwest Nature Shop (154 Oak St., Ashland) between 9am to 2pm. We’ll also be providing same-day plant sales at this location. If your billing address is within Josephine County, your plants will be ready for pickup at the Illinois Valley Soil and Water Conservation District Office (219 Redwood Hwy, Cave Junction) between 10am to 1pm.